They key to using social media for holiday marketing, he wrote, is motivating consumers to share their purchases, their experiences and their likes with their friends. And yet, as any business owner knows, it can be challenging to get news about your deal, your special event or your new product heard above all the rest of the online noise. According to Forbes, 79 percent of consumers Like a brand on Facebook exclusively for offers, discounts and incentives, making Facebook one of the best places to advertise sales. A simple status update that highlights a sale can reach a large number of your business’s existing fans. When crafting sale-related posts, think about why people have become fans of your business. For early access to sales? For access to monthly giveaways? Whatever the reason, use status updates to deliver offers that are special to your fans only. 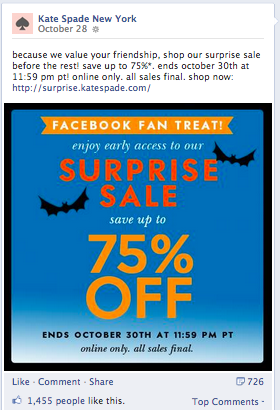 Kate Spade often offers Facebook fans early access to online sales. The example below is seasonal — from Halloween — but you could easily do the same thing for any upcoming holiday. The clothing brand J. Crew recently made headlines for posting its entire fall collection on its Pinterest Page, giving Pinterest users a first look at the brand’s new clothes and the opportunity place pre-orders. 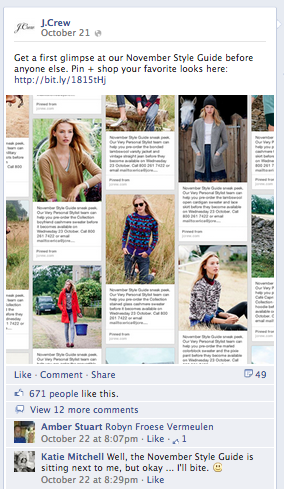 They then used a Facebook status update to share their “November Style Guide” with their fans. This was a well-executed idea for how businesses can use social media to focus attention on new and/or soon-to-be-released products during the holidays. 1. They created a feeling of exclusivity. Using the phrases “Get a first glance” and “Before anyone else” made J.Crew’s fans feel like they were discovering something about the brand before anyone else. The takeaway here: Use your post to make fans feel like you’re letting them in on something special. Try this sort of update during the holidays to get more engagement on your updates. 2. They cross-promoted another important platform: Pinterest. When you use your most popular social channel (for J.Crew, it’s Facebook, where they have one million fans) to promote one of your other social channels, you often see a boost in followers on your lesser popular platform. The reason? Your fans are now aware that your brand is active on another platform! When fans see that your brand is posting unique, quality content on your other social accounts, they’ll want keep up with your brand on those platforms, too. Don’t underestimate the power of visuals. A good image can effectively share a message and get people to react quickly, allowing your business to gather insightful data from followers. Such is the case with Everpurse’s status update featured below. 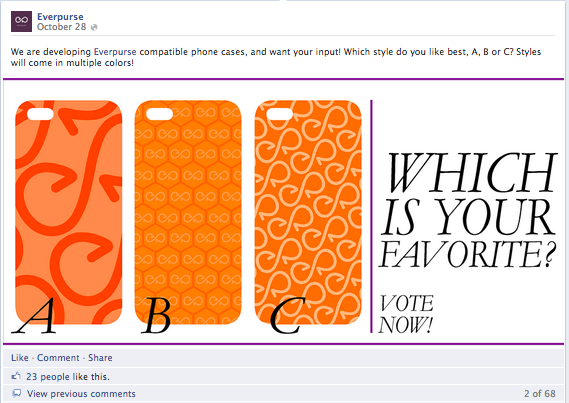 Without even reading the copy of the post, fans know what they should do: select their favorite design. Fill-in-the-blank posts on Facebook are generally effective and this is a visual version of that idea. Everpurse received more than 68 comments on their status update — those 68 comments will no doubt influence their upcoming production decisions. You can use the same principles of Everpurse’s status update to create Facebook posts that help your business get fast feedback from your fans this holiday season. Then use the data you collect to decide which items you should spend more of your promotion dollars on. We hope you liked this sneak peek of our latest free PDF! CLICK HERE TO SEE 7 MORE perfectly crafted Facebook status updates along with lots of helpful posting best practices and tips.